This week has been a week of many firsts; First time flying, first time abroad, ect ect. The holiday was a celebration for my Girlfriends 21st Birthday and we certainly did just that. What I didn't intend however was for the wildlife to be so presentable! Everything was so much easier in Spain! 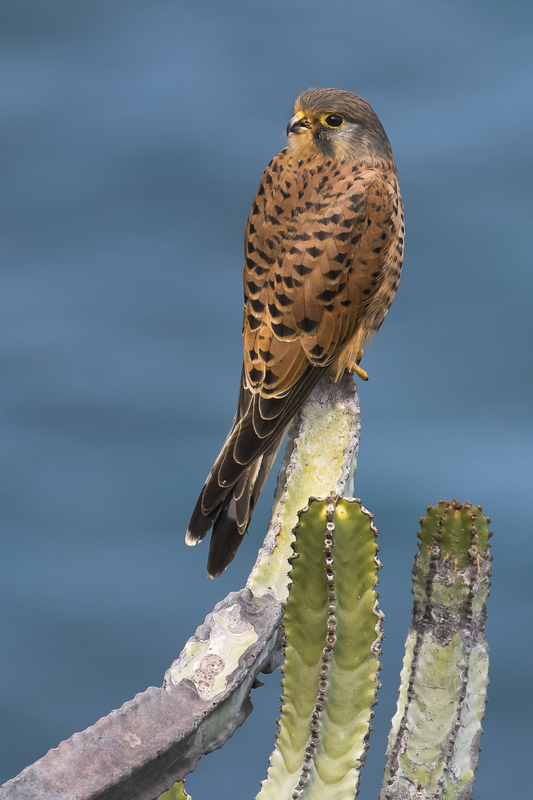 To get a picture of a Kestrel like this I would have to put weeks of effort sat in a cold hide in the Uk but in Spain they would perch up like pigeons! The photographs I got on the trip weren't hard come by what so ever.. Most were on casual walks along the coastal path and 2 minutes from the hotel on the nearest patch. I should stress that it was not a wildlife holiday at all and I had no intension (despite bringing the camera) to spend much time photographing wildlife. It was just so easy... Because the wildlife was so approachable, it meant that we could do pretty much everything we had planned on this trip, including having a relax. Below is a scene from one of our many coastal walks and as you can see, the scenery is fantastic and me being me, spotted a fair few birds along this section of the overhang. You can just about see the kestrel in the phone picture and that gives you an idea of how close these birds actually are. Something I can't show you however is the sound as I didn't have my recording gear but that is something I will miss for a long time, or at-least till spring arrives here in the Uk. Birds were singing constantly throughout the day due to the climate and when they weren't singing at night, they were replaced with the sounds of crickets. 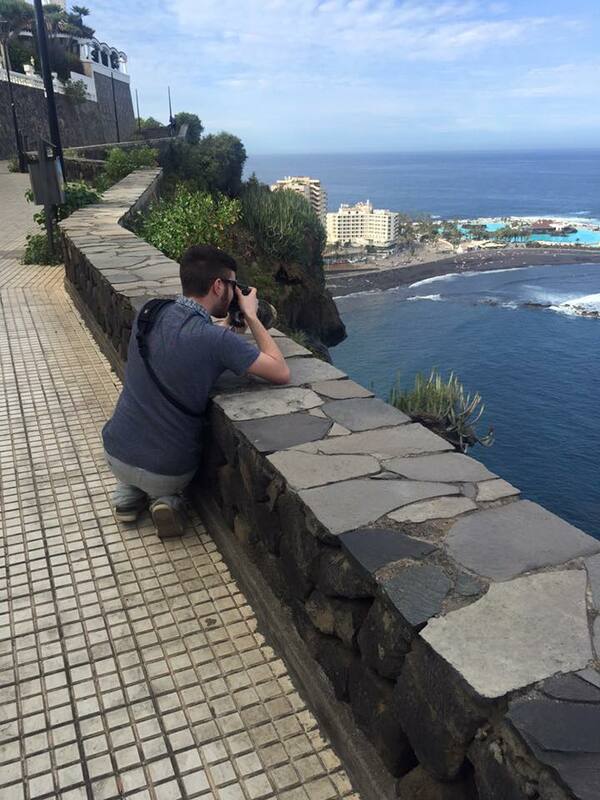 It was beautiful and the island really was painted with the sound of canaries. I made everything sound so easy so far and while that remains true for the most part, there was 1 single bird that I had real trouble with and it was only this species that I had to rely on some bush skills in order to produce any kind of photograph. This was the Sardinian Warbler.. Much like our Common/Lesser Whitethroats, the Sardinian Warbler is a scrubland bird that spends most of the time in the thick shrub tucked away from site while foraging for insects. Below is about the only decent image I managed to get but the Sun had gone down by that point. I didn't get to see many large birds really, other than Gulls, Little Egret and a single Juvi Peregrine Falcon. Most birds I did see were quite common really, including this Canary Island Chiffchaff which compared to our own Common Chiffchaff, shares the exact same look but sounds completely different. It should have been called a 'Chiffchiff' because there isn't much difference between the 2 notes they sing. Despite there being plenty of them, I didn't really get my intended photograph of the Canaries but here is a sharpish one below. If you're interested in what hotel we stayed at, it's called Riu Garoe and I would highly recommend this hotel. Food was top quality, location was superb for everything. 15-30 minutes walk from pretty much everything of interest, 5 minute walk from the coastline and bus/taxi rank on tap so you can really explore the island. If you're interested in doing something like this yourself, please contact - Dean Legge: he is an absolutely amazing travel agent and I highly recommend him. I have plenty more to share about the Spain trip but I'll spread it out in a couple of blog posts. I'll leave it there for now, hope you've enjoyed some of the photographs from this trip. It was certainly a shock to the system coming back to 2c having come from 27c!.